“The answer is yes, it would be a great experience for our students,” he said. 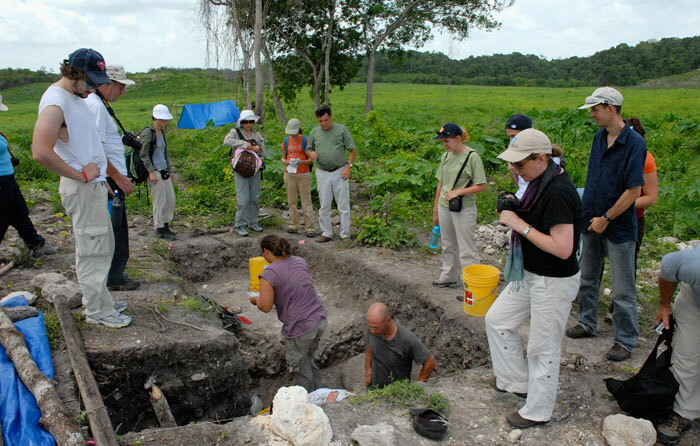 The site is part of the Maya Research Program, a nonprofit organization based in Fort Worth that sponsors archaeological and ethnographic research in Central and South America. “I’m working to design a student experience so that we can get our students involved with discovering what the Maya civilization was like,” he said. “I’d like to put together a team of students to go down there and do the archaeology and the survey part of the work so we can have an exchange of archaeological experience and survey experience,” he said. “How big a team, I don’t know. It all depends on funding.” He said he’s looking at July 2009 to take a group of students to Belize. During his work at Blue Creek last summer, Warden was using the Center for Heritage Conservation’s high-tech equipment to document buildings, artifacts and graves at Blue Creek’s five sites, some in the jungle and some on farmland. The sites provide many challenges to researchers. “It’s very physical, hard work,” said Warden. “It might be a 2- or 3-kilometer hike into the jungle before you get to where you’re going, carrying jugs of water and everything else in,” he said. Typically, researchers from the center use several sizeable pieces of equipment — a total station, a laser scanner, large, heavy tripods, car batteries to power equipment, tools, laptops and cameras, all of which have to be lugged to the dig site. In addition to the 90-degree weather and high humidity, jungle creatures abound. “A woman in one group had a snake strike her boot,” he said, despite local Mayans who do snake control. 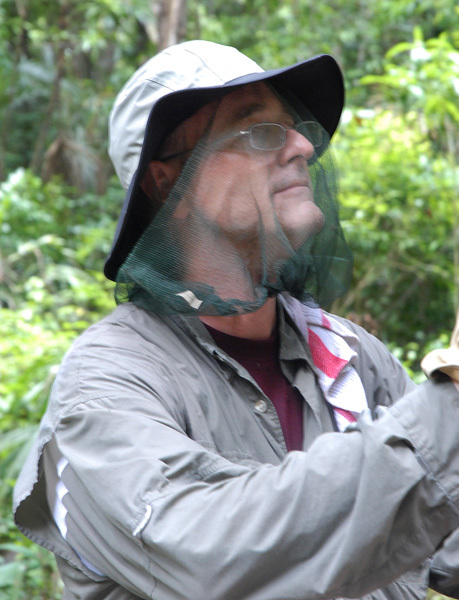 “I wore gloves, long-sleeved shirts, snake guards for my shins and mosquito netting over my head,” said Warden. Creatures are only part of the challenge. “The sites are fairly large, and there’s multiple buildings per site,” said Warden. “When you’re uncovering pyramids that are 45 feet tall, there’s a lot of dirt that has to be moved, and usually there’s a pyramid complex and other residential buildings and public buildings. These are new sites so they’re just beginning to understand which sites are where.” Some of them also have buildings and artifacts from a number of different historical periods within one site. After a day’s work, researchers head back to their temporary home near the dig sites. 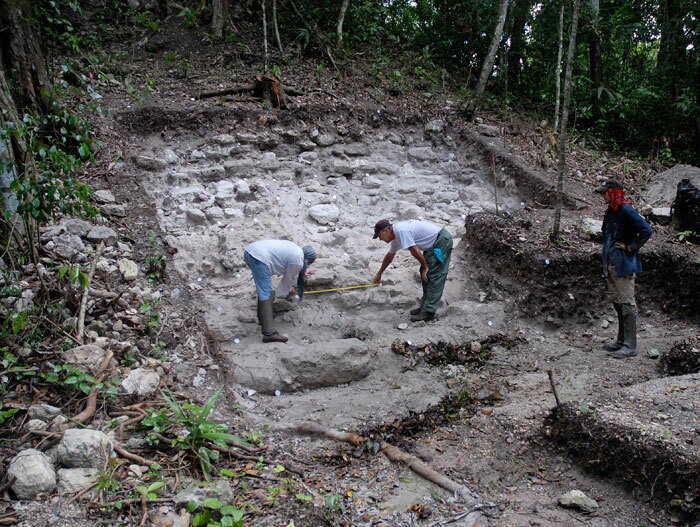 Two times a week, said Warden, there are lectures in the evenings by other archaeologists or others who know about Maya civilization, and he chipped in this summer by giving a lecture on different methods of documenting. Warden and some of his cohorts had work to do in the evenings, heading to a house near the sleeping quarters to process the data they’d collected and get ready for the next day. “It’s not in a town, so you can play cards, read books, or sit and talk to each other,” he said. At the end of the day, researchers sleep in a tent shack without air conditioning or electricity, then head out back to dig sites to discover more history. Jackson authors book; ranks U.S.